Paul Schuur, Senior Consultant – Qwise B.V., Holland "I like the small physical size of DNSBOX, its flashed based disk architecture, and easy to use admin interface..."
Randy Haynes, Senior Network Engineer, EDS, USA "DNSBOX’s in-built monitoring system shows physical device health and gives a clear picture of logical resources utilization." Samson Oduor, Access Kenya, Kenya "DNSBOX's technical crew made implementation easy... We appreciate the "going above and beyond"." 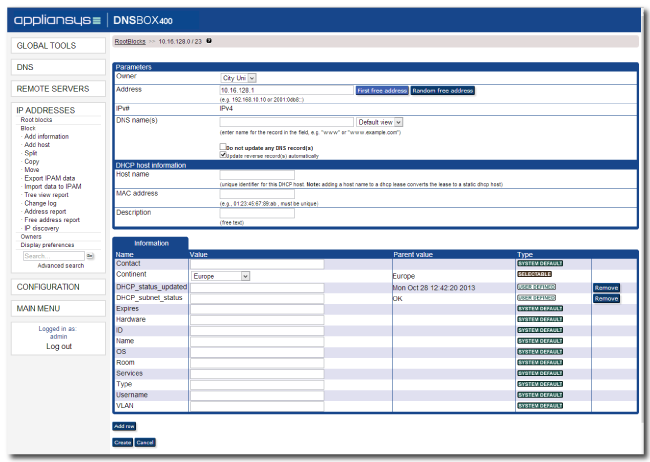 James Montoya, US Geological Survey, Colorado "With DNSBOX , administration can easily be passed on through business generations without worrying about maintaining lots of specialist local knowledge and the risk of losing it." Planning, tracking and managing IP address usage is a complex, time consuming job. You need to manually edit information on IP addresses, organise them into groups and often make individual changes. This is tedious and error-prone. The unscheduled arrival and departure of users and devices means you have to constantly update your plan to reflect any changes to your network – in practice, records are often not updated accurately. Static IP address plans are problematic: you might plan to allocate an IP address to one device and end up allocating it to another. It’s difficult to determine which IP addresses are in use. For example, there may be devices you don’t know about. Every time you want to lease a particular IP address, you need to check in several places to see if the address is free and pinging it is unreliable. IP address conflicts can stop devices from working, or in rare events cause a server outage. This could require lengthy troubleshooting. Processes for managing IP addresses and domain names are carried out on separate systems, leading to data inconsistencies. Where managing address space is delegated to multiple teams/individuals, it is difficult to control who can edit what, and put workflows in place. With no version or document control there is no standardised format for data entry: only one person can safely work on IPAM data at a time and the risk of unrecoverable data loss – through files being deleted, overwritten or corrupted – is high. Reporting is often nothing more than “cutting and pasting” long lists of IP addresses. A lot of work is required to create informative reports that can enable accurate planning and monitoring the use of your IP address space. With a purpose built IPAM solution you can quickly allocate addresses in a planned and coordinated way, easily monitoring and responding to demands across your organisation. 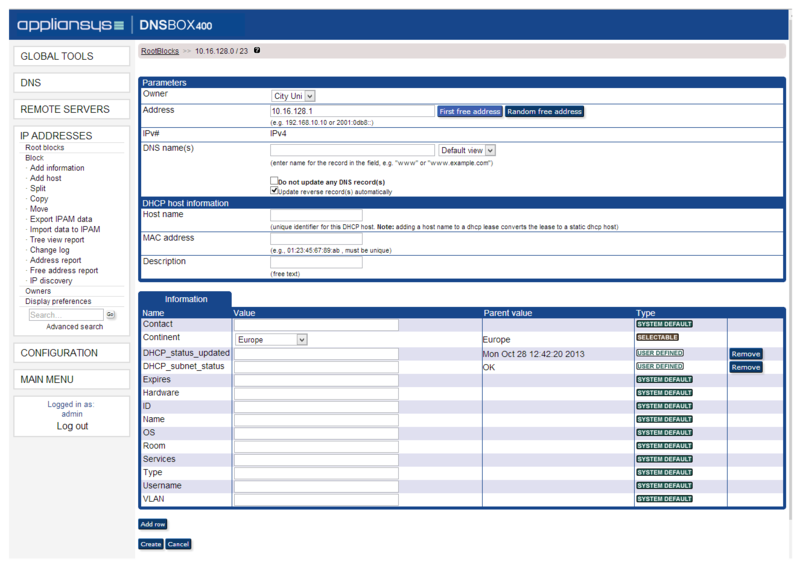 A DDI solution like DNSBOX makes your IPAM easier through better planning and control. Using a purpose built IPAM tool is much easier than modifying data in a spreadsheet. You can divide your address space into a hierarchy of blocks and sub-blocks/subnets – right down to individual IP address levels – and define them as either available for use or reserved. Customisable fields/tags allow you to record specific attributes to your data, such as device location and contact details. You can also search for specific zones, domain names and resource records and even quickly modify all data objects matching specific conditions. So, for example, you can search for a printer located on floor 3 in the Business School and find out that its IP address is 10.16.136.0 and it is owned by Mr. Smith, whose e-mail address is mrsmith@university.com. With options such as subnet scanning, you can automatically detect and add any new devices with static IP addresses. An IPAM application simplifies the process of calculating available IPs and eliminates the risk of address conflict by automatically identifying available blocks and addresses for you. Changes to DNS data and DHCP leases will be immediately visible alongside IPAM data and vice versa, giving you a real-time view of your IP space. You don’t have to worry about scrapping your existing DNS / DHCP system. Some specialist DDI solutions allow you to overlay an IPAM platform onto your existing infrastructure, including Microsoft AD and BIND. If you have more than one network, or your network is large with multiple teams looking after their own IP space, you can delegate the management of certain IP blocks to organisations, groups or individuals. For example, the accounting department in a university may have their own network administrator who will be able to log into the web interface and manage only their part of the network IP address space. All changes are made in real time and can be made simultaneously. 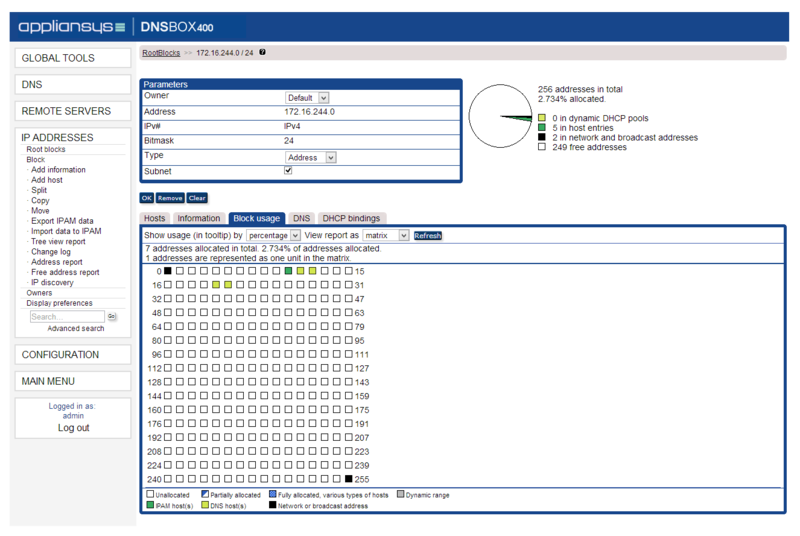 Some IPAM platforms provide visual reports for a clear, holistic picture of your IP space. For instance, you can tell from a graph how many available and reserved IP addresses you have inside a particular block. You can also schedule regular reporting by email to see things like all used IP addresses.